next up, from the perfectly preppy collection — the tee time design. 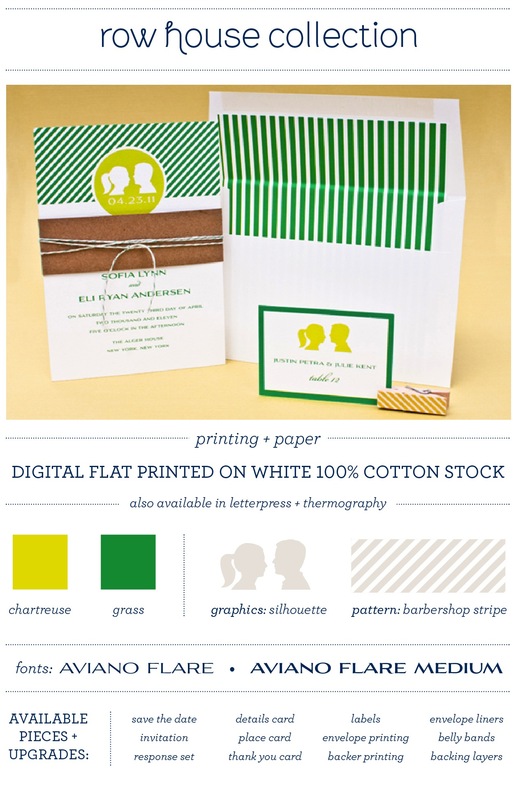 the tee time design was created for a preppy pair with country club style. they swoon over fun colors and sweet details. and since they met at a company golf outing…naturally he got down on one knee on the green. at mtbs, we are all about color, pattern, simplicity and something for every style and budget. 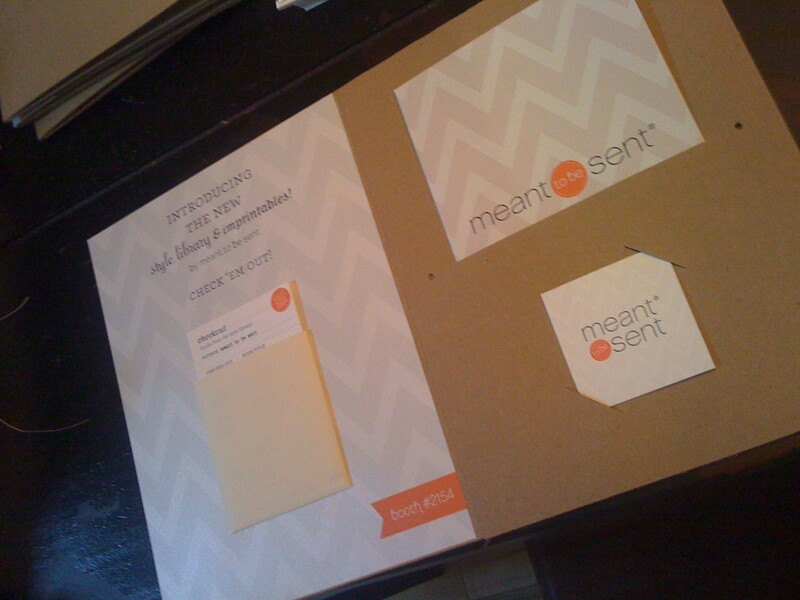 so this, and all of our designs can be customized with colors and fonts and printing to fit with your personal style. then, dress it up even more! 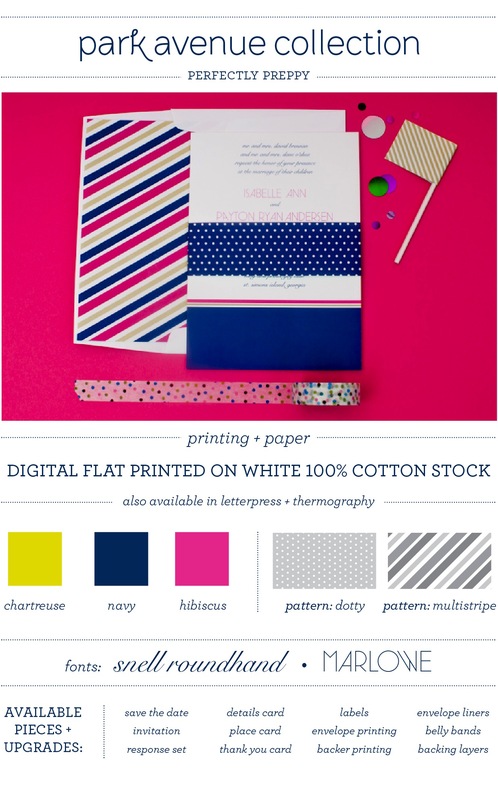 add envelope liners, bellybands and backing layers to mix and match pattern and color to create a one of a kind look! if you’re a retailer interested in carrying our line, please contact us and let us know which albums or products you are interested in! next up, from the perfectly preppy collection — the cabana chic design. the cabana chic design was created for a the couple with sophisticated, seaside style. their taste is impeccable, but they’ve got their casual side too. in fact, they’re the perfect mix of casual and luxury…and certainly don’t mind getting sand between their toes. 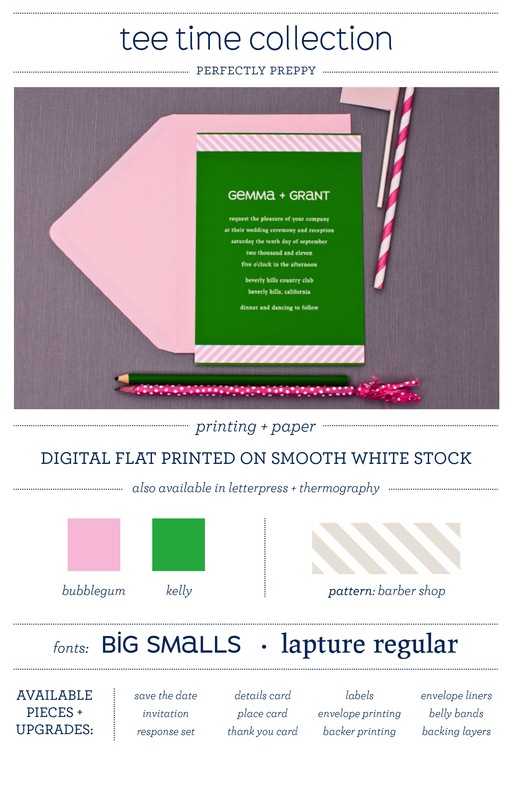 next up, from the perfectly preppy collection — the gramercy park design. the gramercy park design was created for a preppy pair with modern style. they love pattern, but want something classic, yet with modern sensibilities. oh, and they’re not afraid of color! they love to take strolls in their quaint downtown and wouldn’t miss a round of golf at their posh country club. you can bet they’ve got a super chic event planned. next up, from the perfectly preppy collection — the yacht club design. are the perfect combo to pull this look together. next up, from the perfectly preppy collection — the park avenue design. the park avenue design was created for a preppy pair with park avenue style. they’re not afraid of color, or mixing stripes and polkadots for that matter! and are likely to be found weekending in the hamptons and jcrew is surely their favorite shopping spot. meet the style library designs! long long overdue, but better late than never :) …a new series highlighting each and every one of the style library collection designs! first up, from the perfectly preppy collection — the row house design. the row house design was inspired by the chic parties that i imagine take place in the quaint row houses in new york’s upper east side. a silhouette is the focus of the design…it’s paired with crisp barbershop stripes and bold colors…making row house a perfect invitation suite for a couple with a uniquely modern, super-polished yet fun style. at mtbs, we are all about color, pattern and simplicity and something for every style and budget. so this, and all of our designs can be customized with colors and fonts and printing to fit with your style. then, dress it up even more! 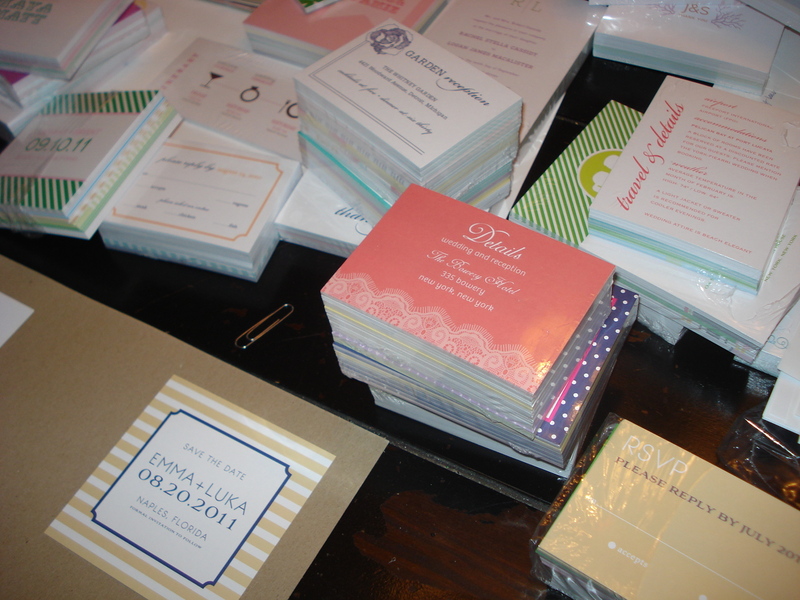 add envelope liners, bellybands and backing layers to mix and match pattern and color to create a one of a kind look! though the researching phase never realllllly ended, (actually is STILL going on for a few minor things) i did finally get to a point where i had gathered a ton of info, vendors and ideas (TOO much!) and it was time to make some decisions and begin to pull it all together. like i mentioned, my branding was TBD for most of the planning process…which made it a bit more difficult to decide on anything, but it finally started coming together just in time to pick out and finalize all the fun stuff! 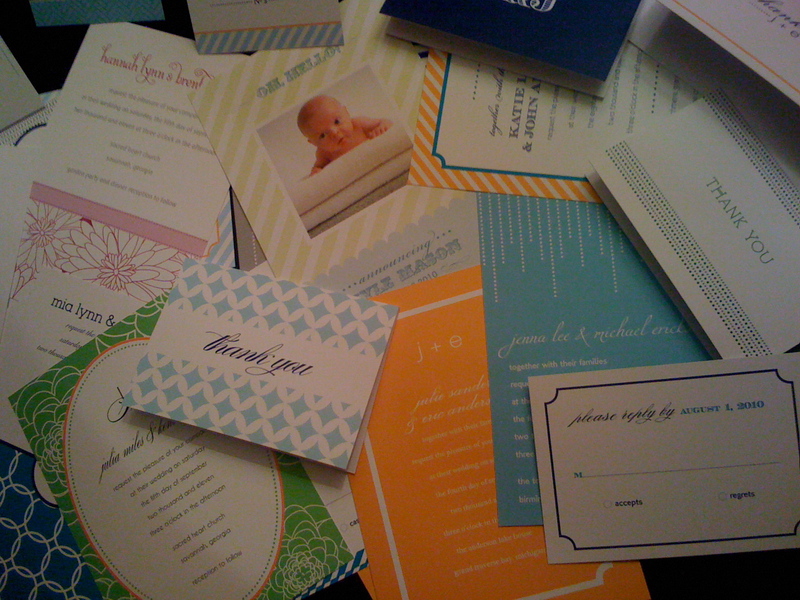 also, i had been testing several printers to use for my new collection, but had pretty much narrowed it down…and just in time because the it was finally coming together plus i had some super fun ideas for my catalog/mailer (one piece would double as both) and press kits to do. so now, to just execute it all and make some FINAL DECISIONS. but honestly, making decisions and moving on was one of the hardest parts…because every decision feels so monumental. but, once they are made…it is the. best. feeling. ever! 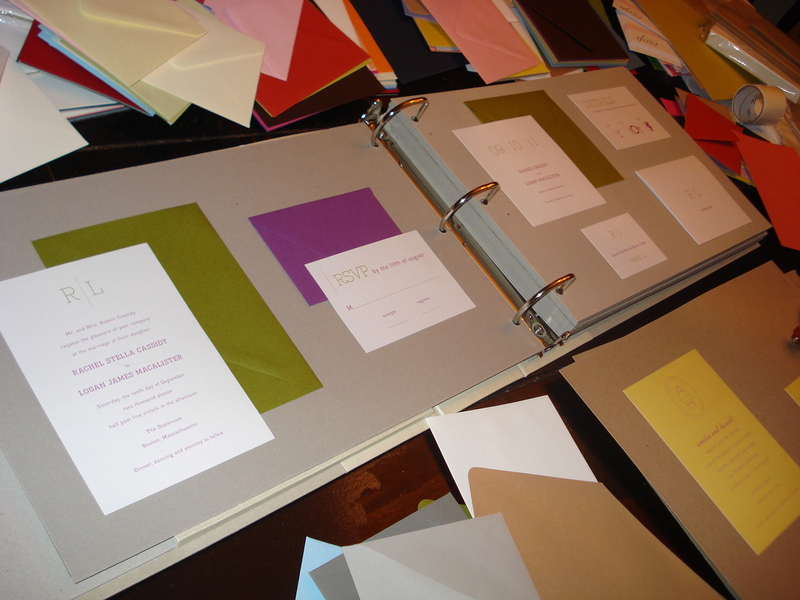 the basic premise of my collection is “something for everyone”…hence the different styles…soooo to build on that even more, i decided to offer several types of printing —digital, offset/thermography, letterpress—for all of the designs in all books. 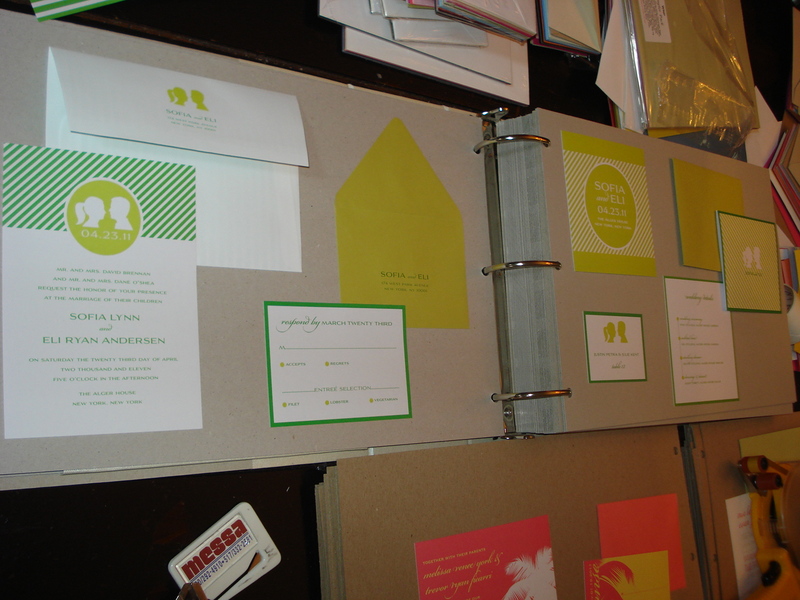 this worked well since most designs lend themselves to all types of printing, so it seemed like a plan! and something for every budget too! and that was the missing little something…check! even tho my designs were all printed, i was still having a zillion convos with my printer about using special papers to help set my line apart even more, at least for digital printing (actually STILL finalizing this, but should know this week!). so along with the different printing came different pricing…to help keep it super simple, i decided to offer pricing based on printing and type of piece across the board instead of different pricing per suite. easy-breezy. 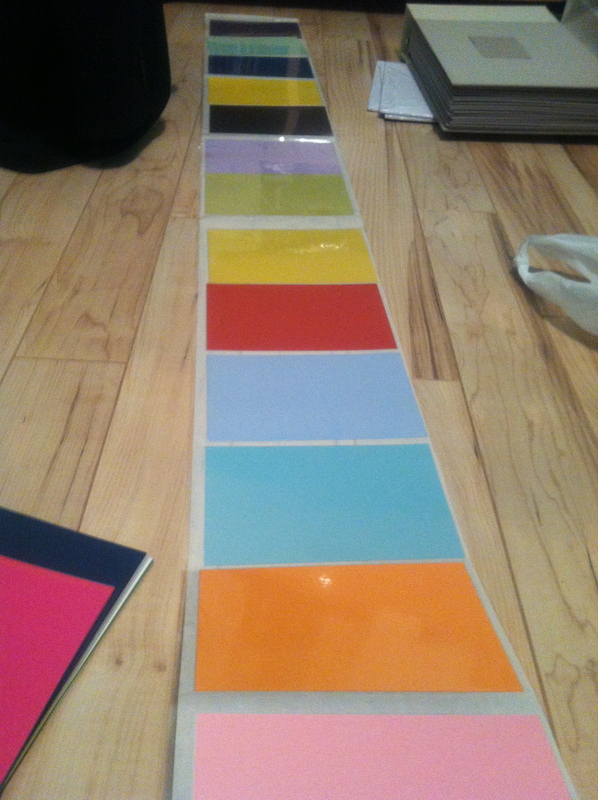 at one point, i thought i might want to do a different color spine per book…but i couldn’t decide which colors!! i had gotten hung up on enough of these kind of decisions and was running out of time…plus it felt right to keep them consistent, airy and neutral like the booth, and let my designs bring in the bold colors and pop out of the books. 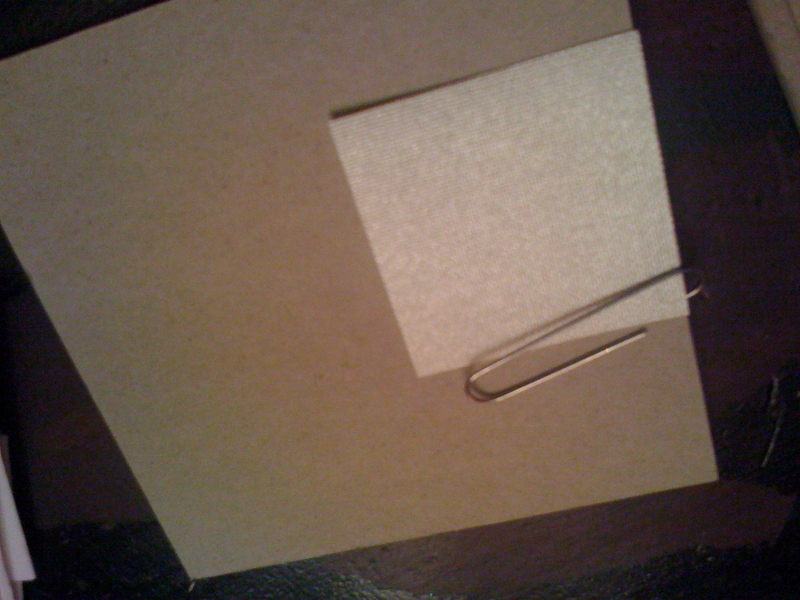 so i found an awesome shimmery whitish cream color that was perfect against the greyish chipboard. yay! 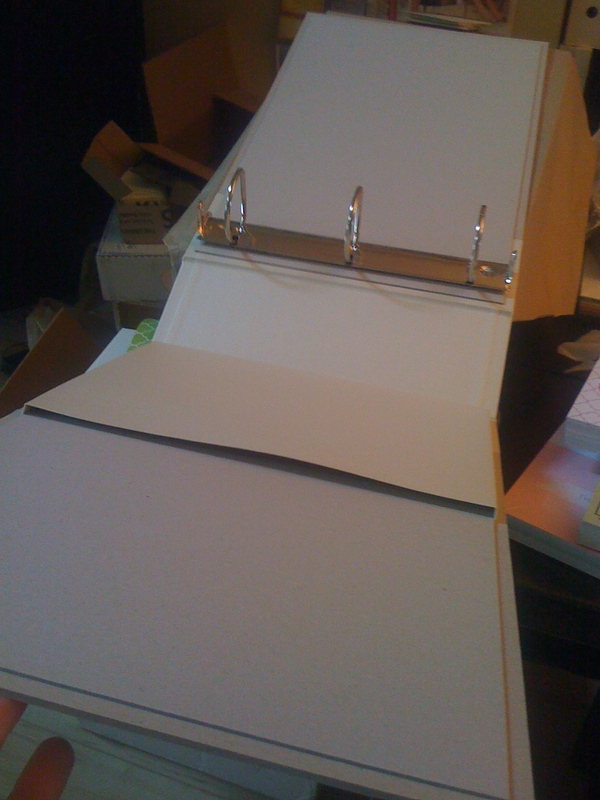 i decided to add a pocket to the inside to hold “style boards” that would show all of my colors, papers and fonts for easy viewing while looking at a design in the book (rather than having to flip back and forth with these on pages in the binder). all about keeping it simple ;) oh and the pocket was also made of the shimmer fabric..it turned out sooooo neat! below :: a picture of the chipboard and fabric swatch from my album vendor and the sketch of the pocket i added. 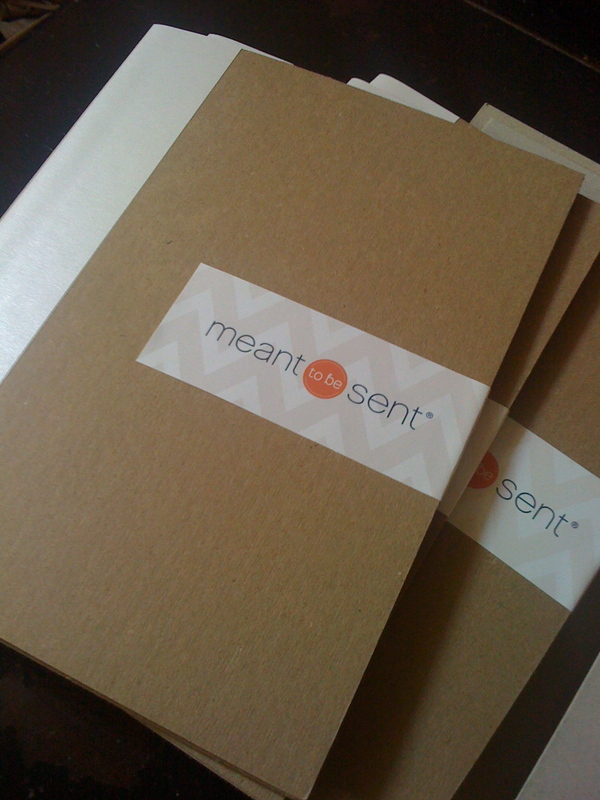 i got it all finalized and ordered soon after…the books came in and they were SO stinkin’ cool! it made it feel like everything was finally coming together…except you’ll notice the books are blank! 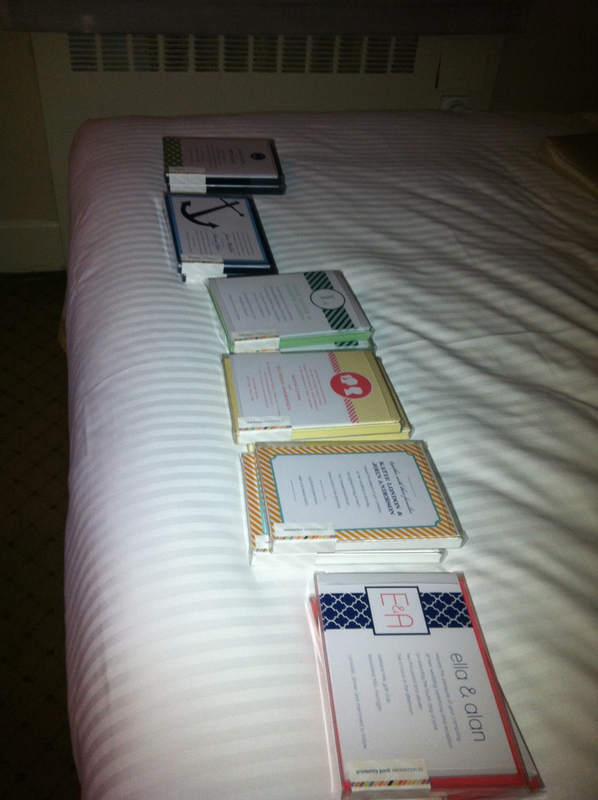 below :: the books when they arrived! for the outside of the books, i had to improvise at the last minute because my original plan to screenprint each book title and my logo on each book was astronomical at such a small quantity. so, i had to kick researching into overdrive again and thought i had found a local vendor to pull it off (and for a great price), only for them to bail on me the week before the show. NICE. so i tried to think of any way i could to salvage the plan…i considered doing decals, iron ons, rub-off transfers, you name it. but ultimately i ended up doing a sticker on the spine and a raised plaque on the front with my chevron pattern and logo, both printed on shimmery paper to match the look of the spine. it turned out great and will be keeping the cover plaque but screenprinting the spines for the albums that were ordered at the show! 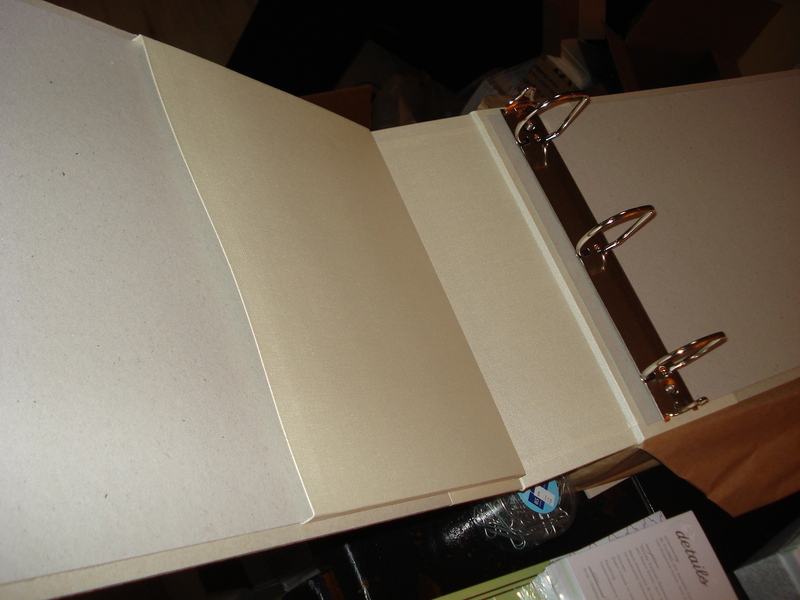 to keep with the neutral, high-end look, i decided to use chipboard pages in the same greyish color. they seemed perfect since they were super substantial (1/16″ thick!) and of course matched perfectly with the books since it was chipboard. but to my surprise, even the super-thick board still tore during the show from all of the turning of the pages! which i guess is good because that meant a lot of traffic! but i was so not happy that happened…so i have since found another route that is super similar and even stronger, since it is not as soft as chipboard. more on that later…. coming up with terms, pricing and process for ordering. 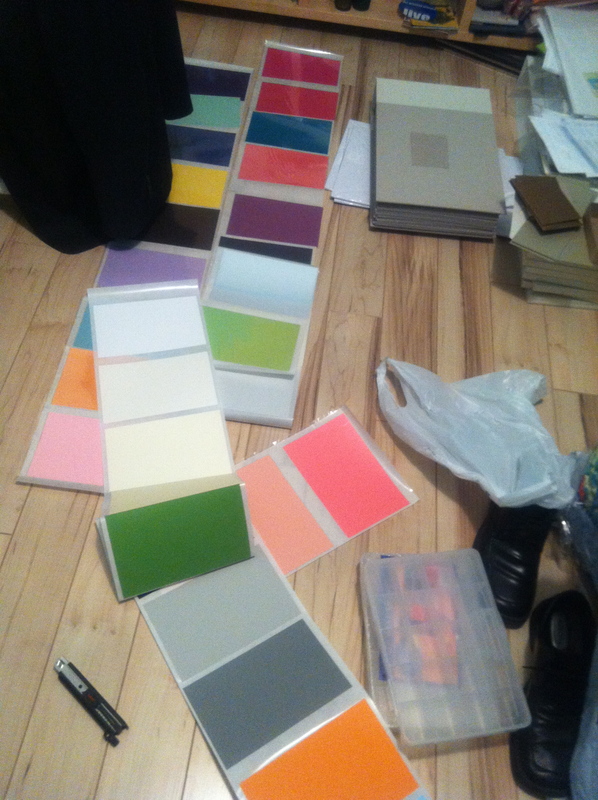 finalizing the color palette (SO not easy if you heart color like me!) and font list for my style boards along with the paper swatch board…and finally laying out and sticking the printed samples to the chipboard pages. 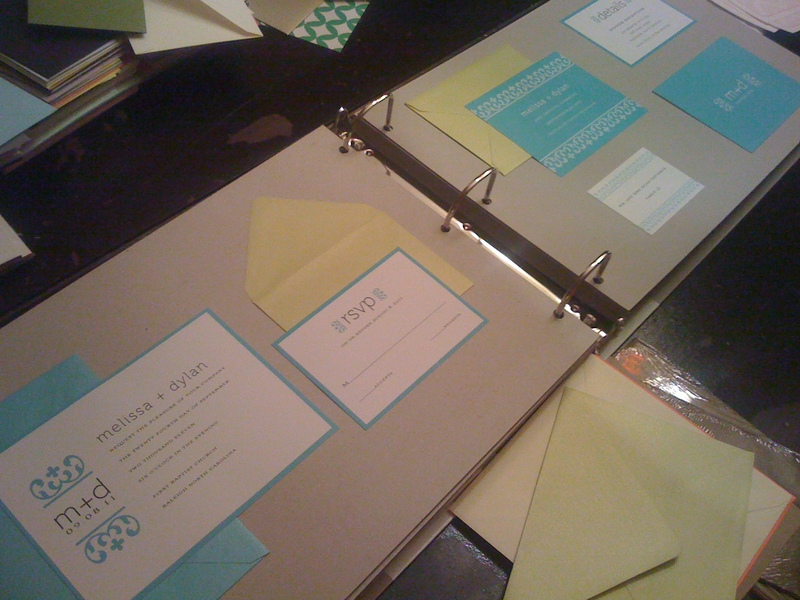 it was amazing how everything really came together when i added the fun envelope colors. below :: pictures of the madness in progress! doesn’t this shot remind you of candyland!? more candyland…and as you can see a big ol mess…running out of space too! for the walls, as my branding was finalized, i knew i wanted to use the all-over chevron pattern and i had a pretty solid idea of how i would layout the whole booth. from the start i knew i wanted frames of some kind (real, printed or decals) on the walls to represent each collection and that i would fill them with the different designs. and i knew i wanted the whole thing to be pretty neutral (so i could let the work stand out against what could be a crazy pattern!). though i felt really good about it, it just seemed SO scary to send the art over to be printed on a BIG scale and not see it first! yikes! so i had asked the vendor i was almost positive i would use… A. if i could get a test print (aka chunk proof) so i could at least see the how the colors and pattern would print on the material and on their printer. and B. when is the last possible date i can get you the artwork (crucial to know this!!!) so i would know how much time i had to tweak. they were AWESOME to work with and more than happy to send chunk proofs (and fast!). so i did a quick mini mockup of one wall and some swatches of color and my logo to see how it would all print. i did a couple different navys and tested some different tints of the chevron pattern and frames. they came back and looked great, so i easily narrowed it down, but still somehow kept tweaking the design ever so slightly up until the last possible day i could send the art. ha! i had a few vendors in mind for the walls…but the pricing pretty much decided for me! so at least that part was easy and proved to be the right decision all around!!! whew! what a RELIEF that was settled!! on to the rest of the booth. like i mentioned with the furniture, i had all sorts of scenarios and combinations of pieces in mind…and only one thing was constant—the ghost chairs! i knew almost right away (though i very seriously considered using some fabulous louis chairs in a cool pattern or bold pop of color) that these were perfect and would add to the airy feel i was after, and not feel heavy in a super small space. all of the rental places i looked into had the ghost chairs too, so that wasn’t an issue. 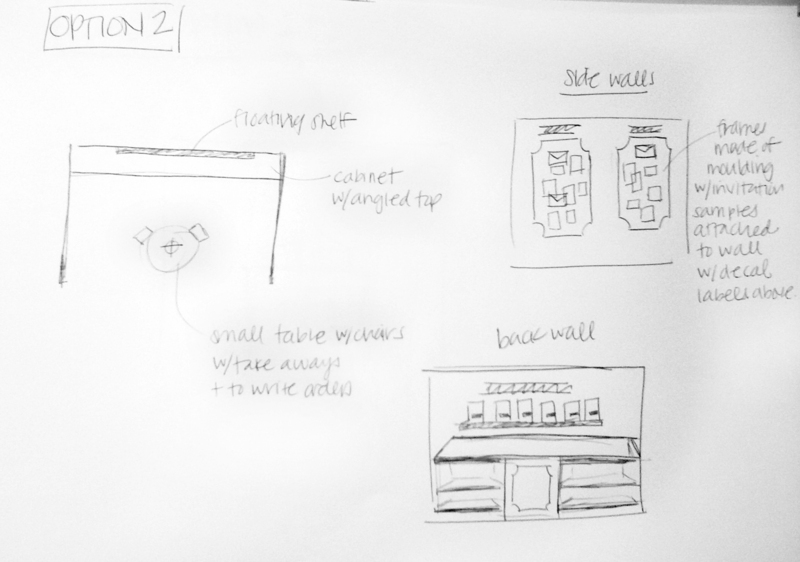 but, i was on the fence about the table i would use with the two ghost chairs, and was still deciding if i would move forward with the cabinet i had designed (see below). 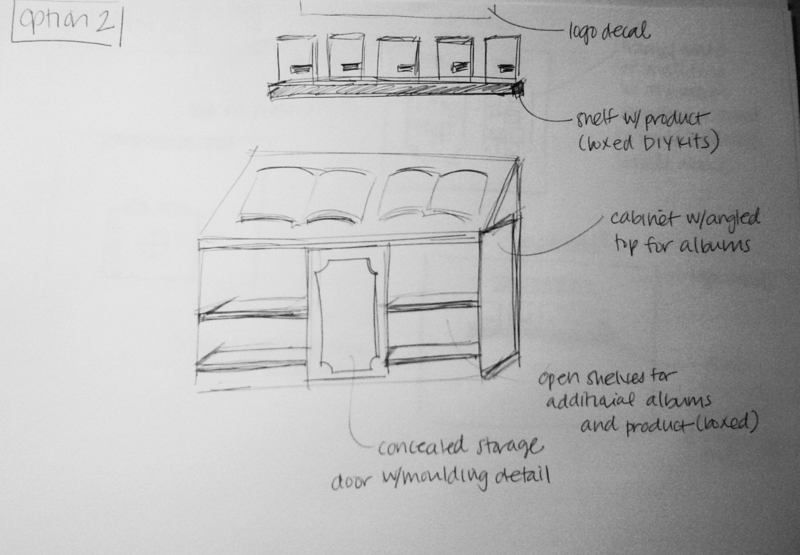 instead of the cabinet, i was considering a buffet/console type table but it was all dependent on how much product i would have and was waiting to see if i would need the extra space or not. in the end, i did not end up having the extra product ready in time, but i still went with the big display cabinet and was glad i did because it gave me lots of extra space and a lockable cabinet! so now, the only big thing that was outstanding for the booth was flooring. i had finally decided to use interlocking foam carpet tiles, A. for comfort and B. cost was not bad. and TONS of places sell these, so i was able to find a spot that had good prices and would send me sample swatches of the colors. then there was lighting…i hemmed and hawed over that for a while too, but kinda decided somewhere along the line that clip-on lights from home depot were jussssst fine. especially when i found out that to have them provided by javits was $99 PER LIGHT to RENT! yikes! so i bought the home depot ones a couple weeks before the show and, to keep it easy, shipped them as part of a bigger shipment direct to my booth, despite the extra handling fee. which meant that WE were installing them, (which you are allowed to do in a small booth space up to a certain number of lights). it was not difficult and worked out fine. but this was one of the things i compromised on from my original just-have-it-all-done-for-me-no-matter-the-cost plan. 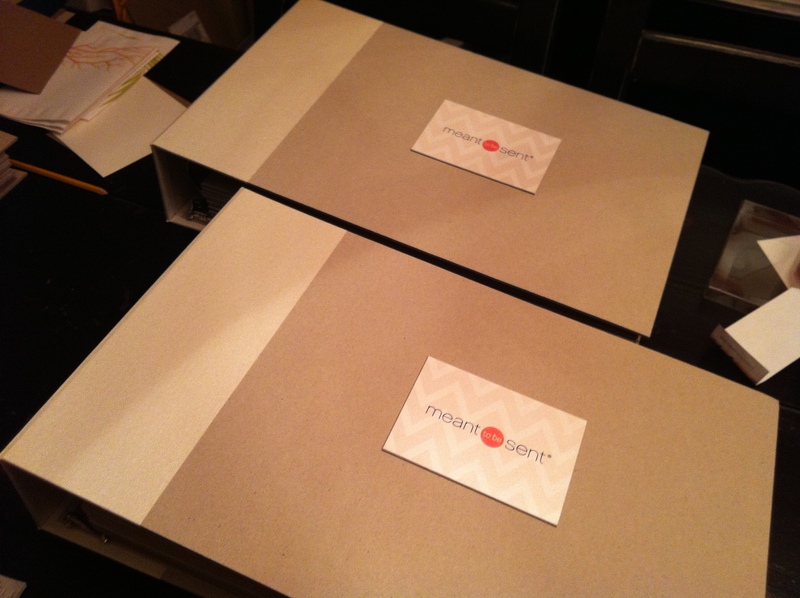 now on to the mailing! i had a super fun idea for my mailing and was on the fence about doing a catalog since they would be another huge expense and take lots of time to design… so, instead i had planned to do a dual-purpose piece that would be used as a mailing and a catalog type handout at the show! 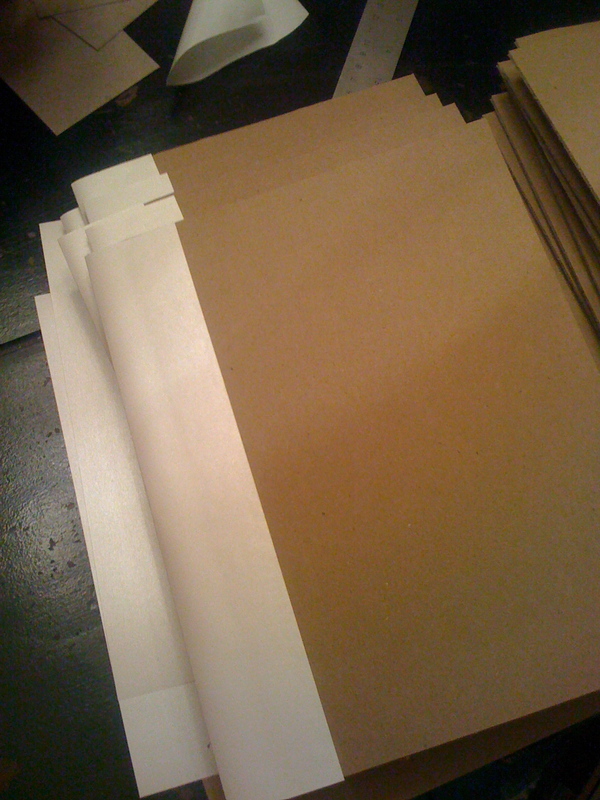 it was one large sheet that would be mailed out folded, but as it unfolded, each panel revealed more information about my line. and finally unfolded to a 17×22″ poster showing 3-4 designs from each of the style library collections! 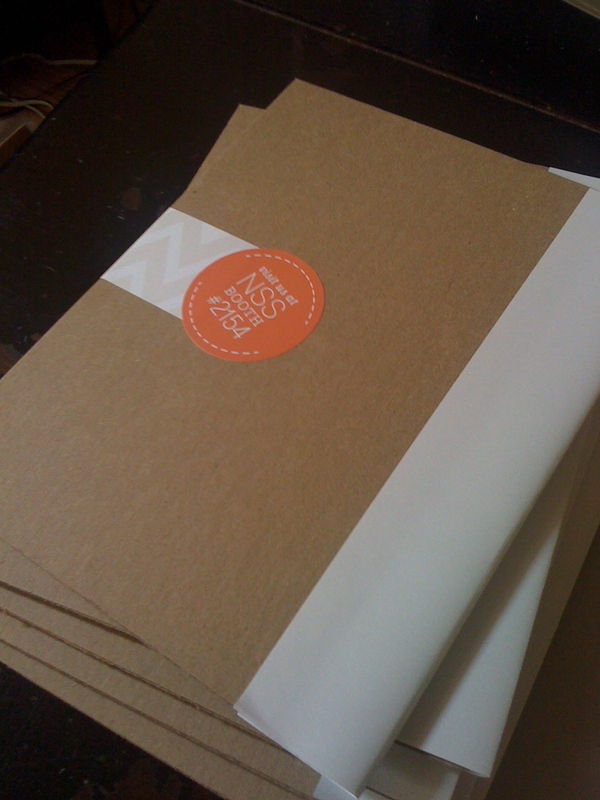 was a fab idea, and totally would have worked but i was cutting it a bit too close with time and budget to print enough to cover both the mailing and handout quantities i needed. so, i ended up doing it but printing a smaller quantity of the poster and designed a simple postcard to mail out instead. saved big-time on postage and printing going this route! and being down to the wire, totally needed a little savings! 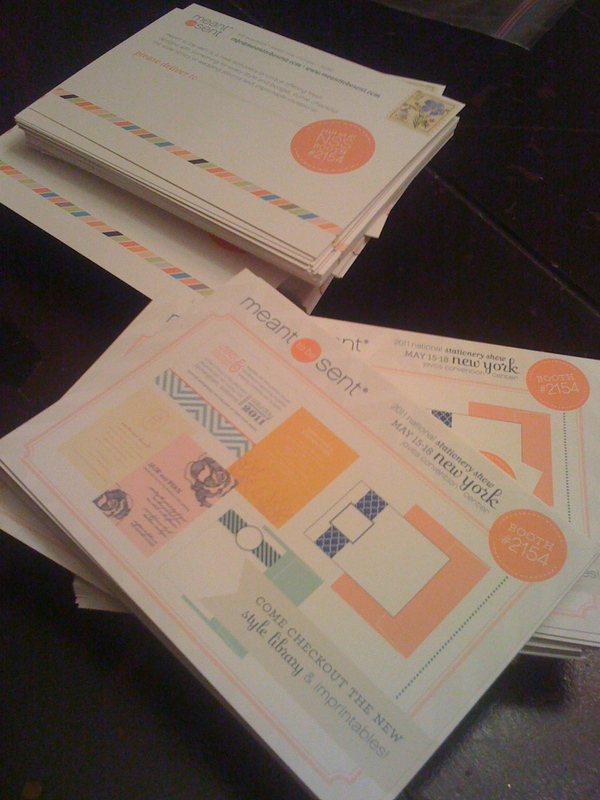 below :: the postcard mailing ready to go out the door! next up, i had to tackle the press kit. i was super excited about these and had a fun way to tie them into my style library concept. 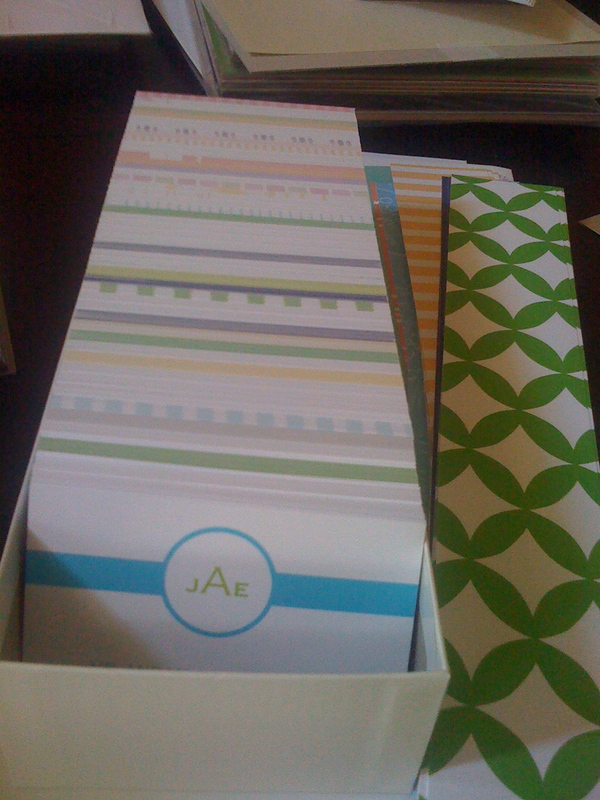 i handmade custom chipboard folders that mimicked the look of my albums and added a library pocket and custom library cards to the inside front cover with information about my business and my line…on the right hand side i created slit pocket to hold the poster and added slits for my shiny new business cards! 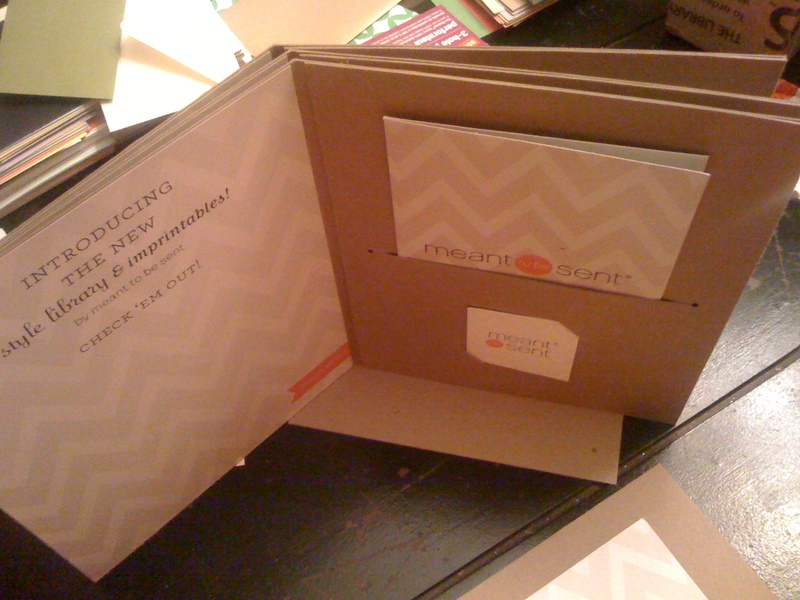 i lined the inside front cover with printed shimmer paper with the chevron pattern and of course my booth number! (you will hear about your booth number A TON as you look into exhibiting. it is pretty much as important as your SS#!) i finished them off with a shimmery library spine and a wrap label with a circle sticker that had my booth number stuck at the end of the label. i was SO happy with how they turned out. one of my favorite parts and really glad i stuck to my plan and was able to pull it together. 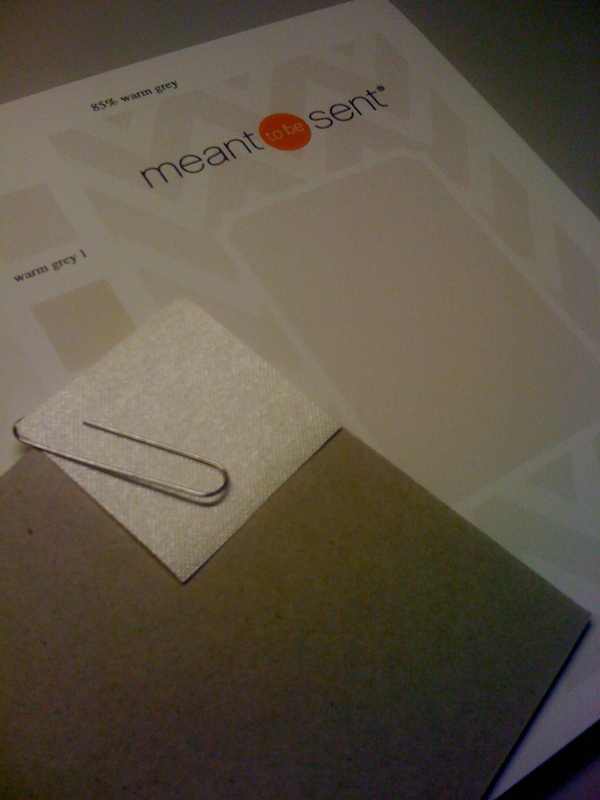 the second card was some info about meant to be sent and the last two were blank cards for taking style notes! 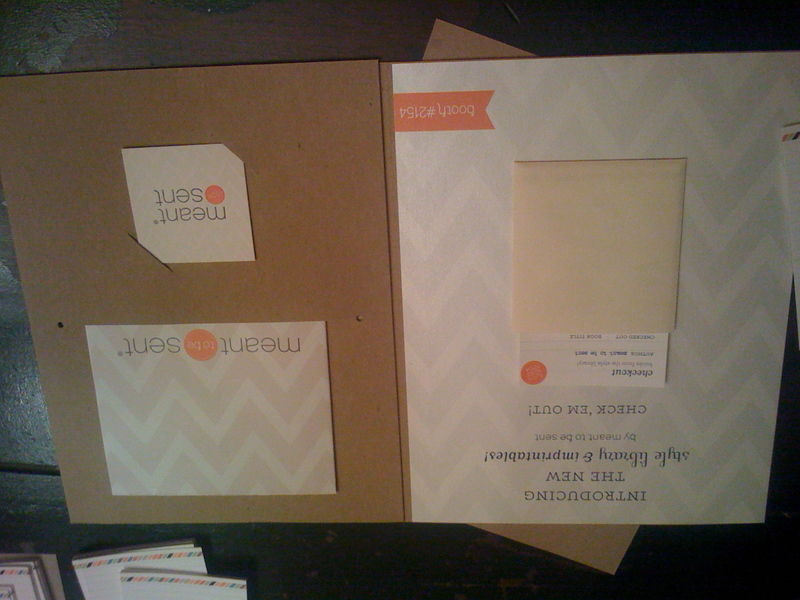 the inside spread with folded poster, biz card and chevron panel! 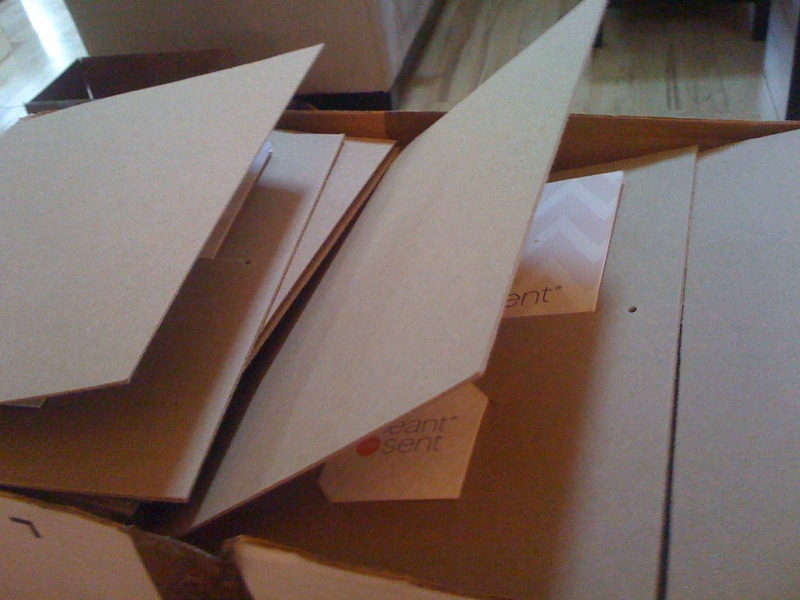 lots of kits piled up and ready to ship to javits! aside from those i had one other thing to put together…i had been nominated for the best new product competition in two categories! yippie! 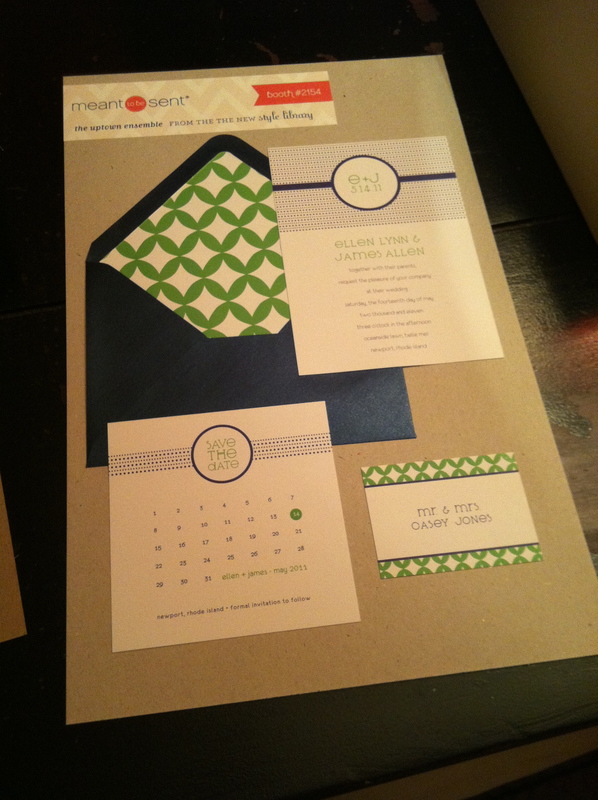 so i had to put boards together super quick before we left for the show…here is one from the perfectly preppy line, entered in the “all things wedding category”! sadly, i did not win, but it is AMAZING exposure just to be entered. your boards are prominently displayed at the main entrance for all to see. DEFINITELY enter if you choose to exhibit! so i think that about covers most of the pulling it together part…all up until just hours before we hopped a plane to JFK! researching for my booth, researching for vendors/printers/products to use for my collection—an ongoing process that is a big task in itself—and researching the (many) rules for the show. i can tell you i have done a lot of research for my business, but never have i ever done so much research in a six month period. ever. ever. after a certain point (probably starting in about december) i literally spent every ounce of time i had (that i wasn’t designing or working) researching. and boy did i learn a LOT—about what i wanted/needed for my products, what would work and what wouldn’t and who i could depend on. though i researched what seemed like a million and one little things, the two main things i researched like crazy were: potential vendors (for printing, albums, paper, packaging etc) and stuff for my booth. when i decided to do this new line, i knew i did not want be my own printer any more. the time and energy it takes to prep files and do the actual printing and fulfillment was just not something i wanted to deal with. and in the spirit of simplifying and streamlining (the premise behind my collection) it made a lot of sense to shift the production outside to allow me to simplify things and focus on designing. so the search was on. i knew i needed a great digital printer. 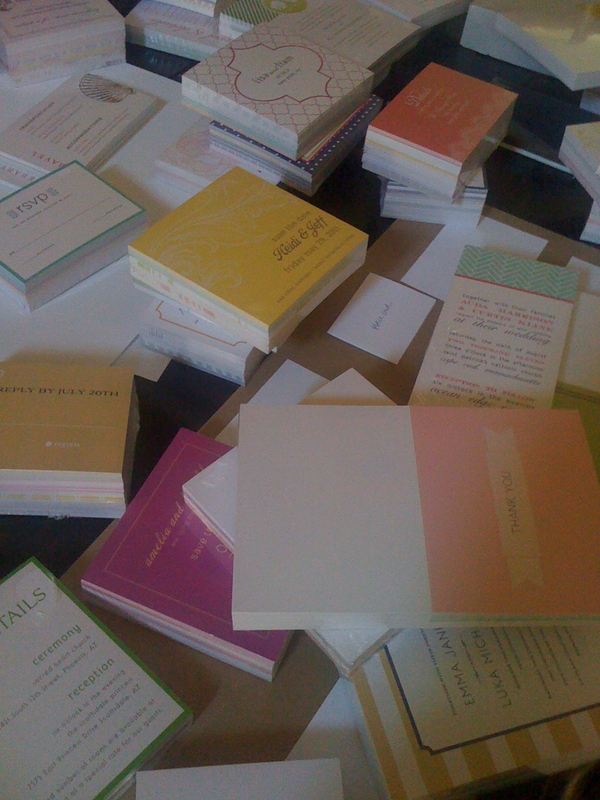 but i also wanted to offer letterpress, offset and thermography as options in my books. again, trying to be a bit different. i’ll tell ya…finding a good printer is not easy. and it’s even harder to find one that offers multiple types of printing, is good at what they do, will offer wholesale pricing and not require you to run 1000 pieces as a minimum. so after TONS and TONS of researching, asking around, tweeting and networking, i found a handful of good options (that are actually all still in play) and have landed on two printers that cover it all, and will be my go-to’s. so why did i choose these printers? 3. response + turnaround time: so important to feel important! so if it takes weeks to (or worse never!) hear back from someone, it’s just not going to work out. on top of the things listed above, make sure you can get test prints from your printer. if it is digital printing, find out what kind of digital press they are using and (attempt to) understand the capabilities and limitations of their equipment. ask them to push the limits if that is what is best for your product…all they can do is say no! also, make sure you are working with pantone colors from the start. 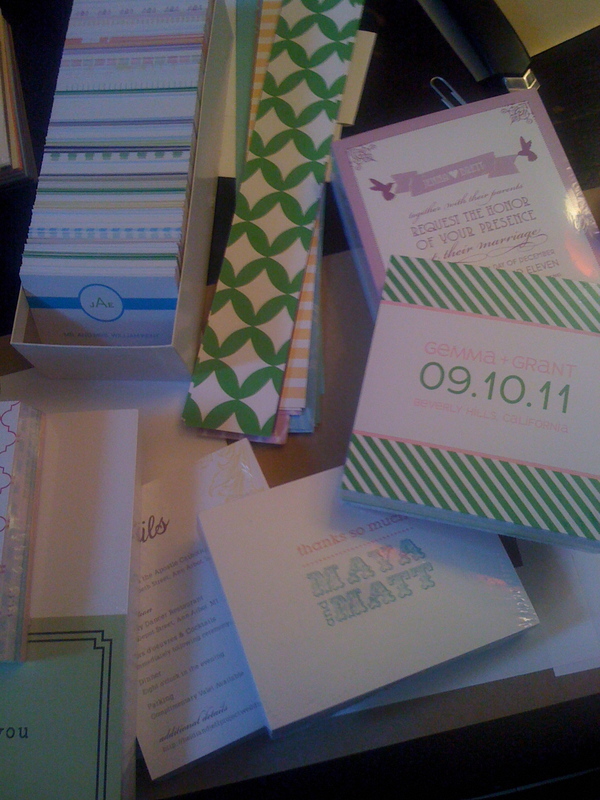 good digital printers can match pms colors! (initially in my sleepless haze, i was just using cmyk colors and had to backtrack! no fun!) but DO A TEST. pick your colors and send a swatch sheet to them to run. find out what settings you should use in your file to get the closest to PMS colors as possible. 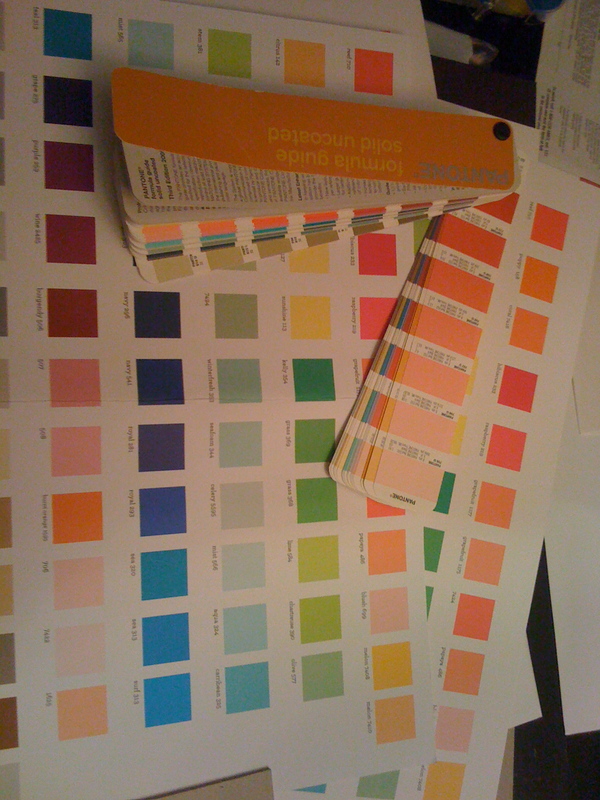 then match up the test swatches to a pantone book and marvel at the results! :D (FYI most colors are pretty dead on, but not all, hence the testing!) starting with pantone colors (even when printing digitally) just makes it that much easier to A. get more consistent color in your orders and B. transition to other print methods that use PMS inks. 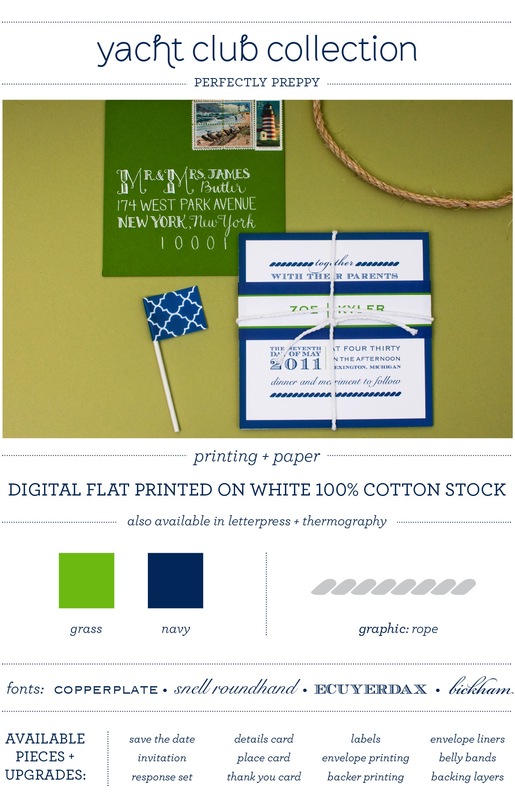 if you are using an offset or letterpress printer, find out if they have a house PMS inks and/or paper options. understand what the fees are to use colors outside of their house inks/paper and if paper is included in the pricing they are giving you. also, keep in mind if you are supplying paper, make sure you know how much overage they require (extra paper) per color or run. 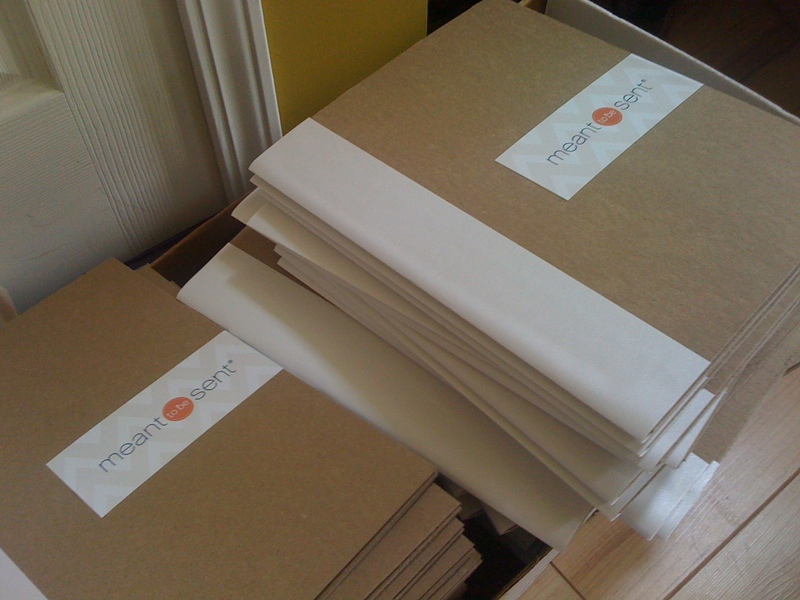 fulfillment is something to consider as well when selecting a printer—and i am still thinking on this. but there are some vendors who will not only fulfill for you (ship printed orders direct to your customer), but will package orders just how you want them! 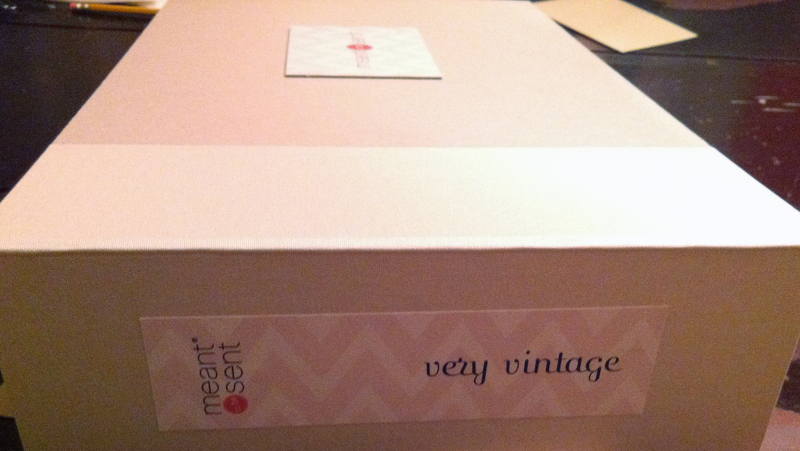 using tissue paper, a logo sticker or clear bags and a nice gift box and ribbon etc. talk about streamlining! definitely something i am considering. 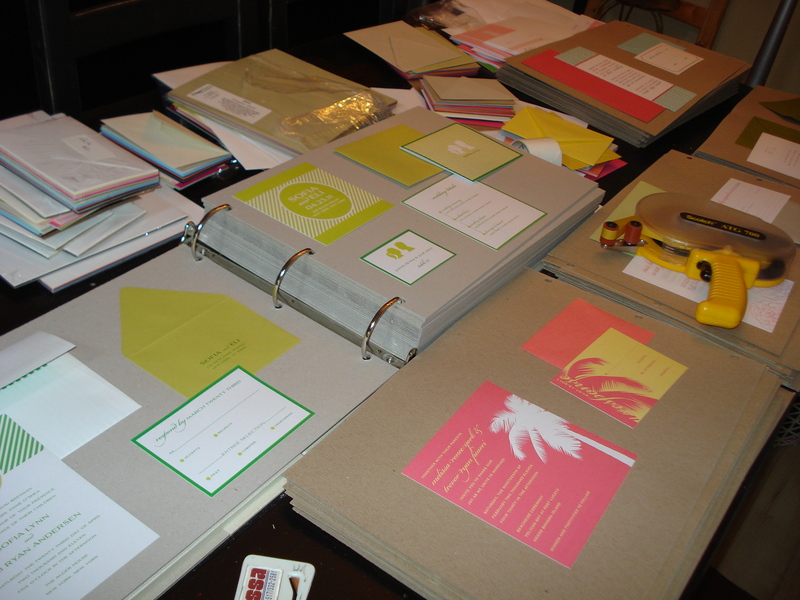 beyond printers, there are paper and envelopes to consider…if you are only going to offer white/ecru as options, then you are likely not going to get hung up on this…but for me, color is a HUGE part of my collection and my style. i heart color! :) so just white was not going to cut it in the new collection. 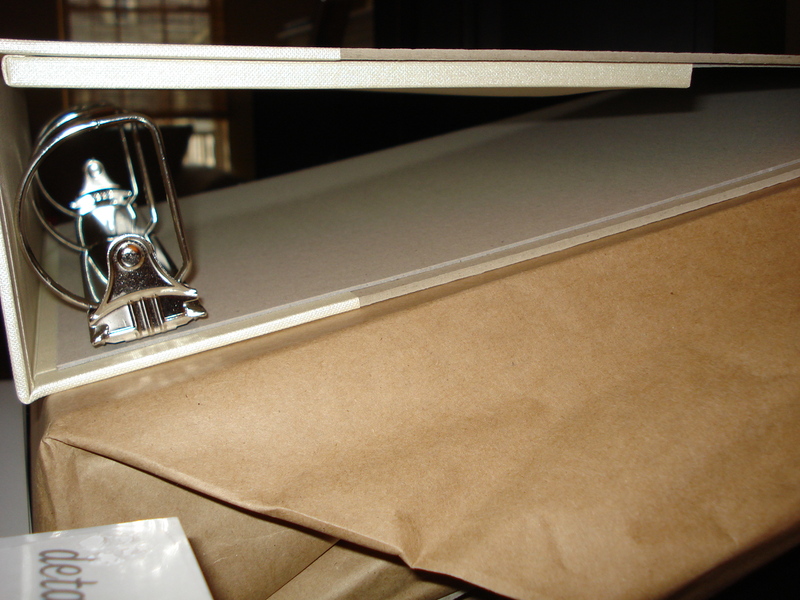 another thing i got hung up on was wanting to use euro flap envelopes. ahhh euroflap envelopes. 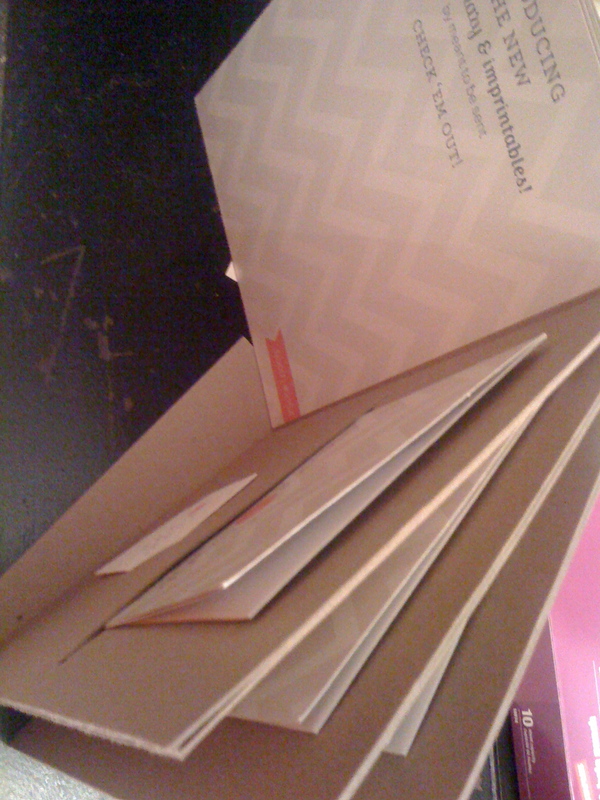 can i just say that EVERY envelope in every color should be available as a euroflap?! oddly enough, the envelope thing was another huge sticking point for me…and, like the color palette, took waaaaay longer to finalize than i anticipated. i just sooooo wanted that extra touch of style in using color and euroflaps…but was having a hard time A. finding a printer who had them as part of their standard line-up even just in white/ecru, and B. finding all of the colors i wanted to use with that flap style. loooooonnng story short, i did not find what i was looking for. BUT i did land on a color and paper palette with lots of colors available in euro and some in both square and euroflap…which ties right into wanting to offer lots of options in the books. yay! finding an album vendor can feel somewhat elusive. trust me they are out there, you just have to master your google skills and network and ask around. one thing i found to be a great way to search (for multiple things) was doing an image search instead of or in addition to a regular web search. i am a visual person, so it was easier for me to spot what i was looking for that way and quickly see if it was at all what i was looking for. however, there is some great stuff hiding in regular web search too, so don’t discount that entirely! one of the things that was super tough was finding someone to do just a few albums for the show, so i could launch the line without having to purchase 50-100 albums up front. this was not easy and i had to do some improvising to put the finishing touches on them myself (which will be slightly improved for the final albums in stores!) but, i ended up finding a great source that was able to do just the quantity i needed for a decent price and they turned out great!!! more details on those up next! when i first set out to exhibit, i knew i wanted to do whatever i possibly could to make the whole booth process an easy-breezy one…even if that meant it was more expensive. that probably sounds a bit strange, but when faced with something so big and unknown, there was comfort in just knowing it would be taken care of. at the time, totally was worth the extra cash for a tiny bit of sanity. so while i pretty much stuck to that thinking, i did make some compromises and eliminate things as it got closer to the show and charges started to pile up. more details on where i landed and what was left out a bit later…. 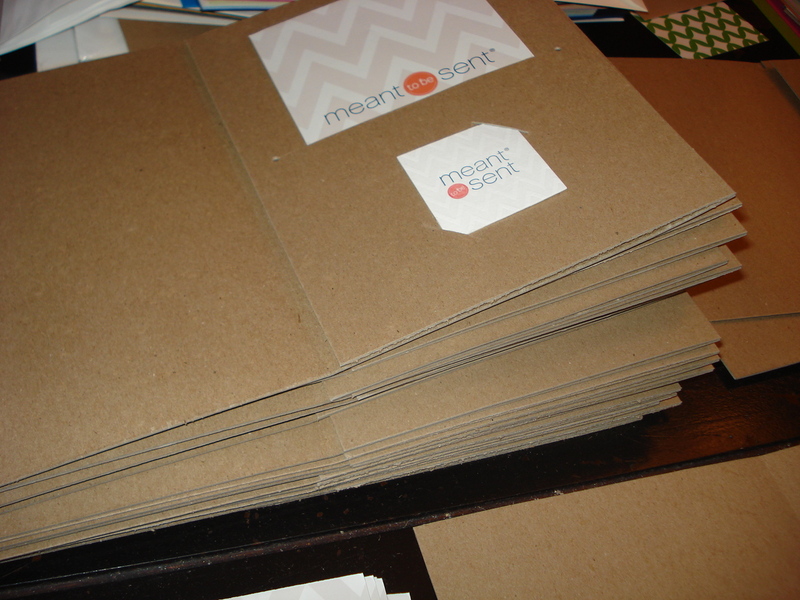 i am not gonna lie…there are a TON of things to consider and research regarding your booth. for me, on top of everything else, one HUGE thing was that i was re-branding during all of this, and my new look was not done until mid march! so a LOT was up in the air look-wise… BUT i knew the vibe i wanted for my new brand, so that helped steer me in a good direction from the start, even tho i had no idea what my logo would look like or the final color palette would be for most of the process! yikes! i did know i was going for a preppy, modern, glam, sophisticated look. i picked out a handful of chairs/tables all with similar looks, some more glam than others, a FABULOUS chandelier (which i later found out due to my booth location and astronomical charges to install it, i could not do—but…maybe next year! :D) and a cabinet (i designed!) for product and albums. really, i pretty much had the booth figured out very early on. however, i did not finalize and order it until the month before. yea, i know. 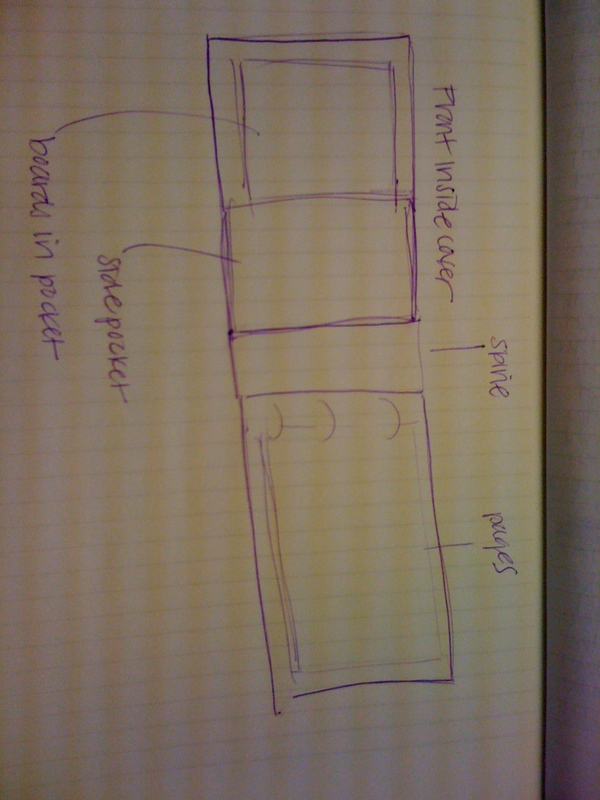 crazy…started early again, but still so much to consider, plus things evolved along the way that made me reconsider a few things…like my product line for instance…i had hoped to have another new product ready for the show, but found out about a month before NSS that it wouldn’t be ready, so that was a big deciding factor on how much storage / display shelving etc i would need. one thing i highly recommend when researching is pinterest. it. is. amazing! it is also a huge time sucker too, so beware of all the pretty pictures! :) but i used it a TON to gather inspiration for my line, my brand and my booth. follow me on pinterest to see more! so it was ironic that the one thing i thought i had figured out way early on and just needed to “place the order” for, turned out to be just as chaotic as the rest of the preparation and still came down to the wire! like i said, i knew i wanted to keep things simple…with a glam, sophisticated look using stuff that would add to the booth, not overwhelm it or take away from the products. that coupled with the fact that the idea of freight terrified me with the cost and potentially having to assemble things on site and then having to store things after. don’t get me wrong, it’s a fine option and most people do that, but for me for the first go at it, simplicity felt better and just couldn’t wrap my head around the logistics of all that on top of everything else at that point. so, very early on in my booth planning, it occurred to me to rent furniture…it was a perfect idea for me not only for simplicity’s sake but believe it or not, cost as well…at least given most of the furniture i was interested in. 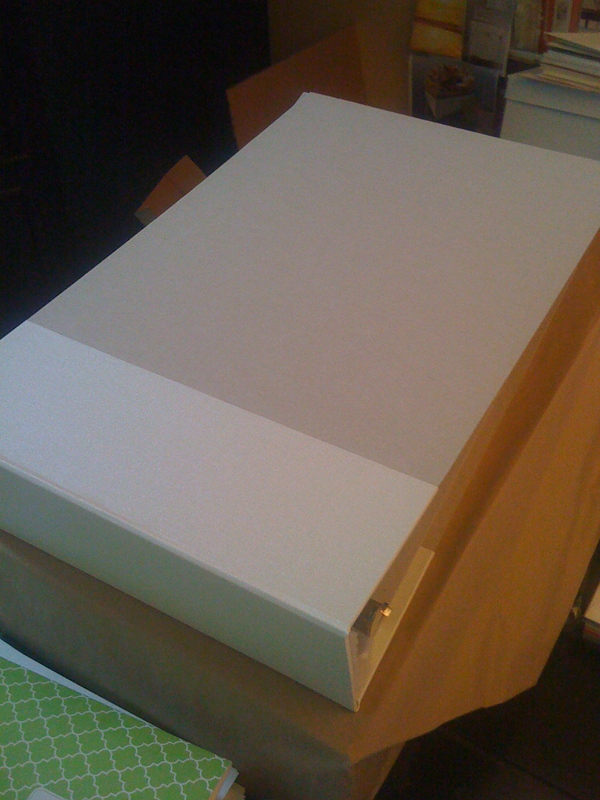 of course over time, it would eventually pay off to buy some bigger pieces and do the shipping, but i had a feeling i would also be changing things up from year to year and had already started racking up the bills for this year, so buying a pricey (though fabulous) statement piece was not on the table. so i looked into lots and lots of boutique-y event rental spots around the city. of course, being in MI i had to rely on their websites for pictures and dimensions. some were super easy to work with and got back to me very quickly, others not so much. but most had pretty similar prices but, of course they get ya with the shipping/delivery charges too. and one of my favorite places that had SO much amazing stuff was way higher on the delivery charges. so, i had to compromise a bit, but it all worked out and ended up with simple pieces that fit the booth perfectly and did not entirely break the bank. FYI: with any shipping/delivery to a tradeshow they really get you on charges…more on that later. i originally looked into both hard walls and foam…hard walls were thrown out the window pretty much right away…so i was considering foam walls with a flood of color and a wainscot along the bottom of the walls with one of my patterns. i still like the idea of this and just might go that route next year :) but i was having a tough time deciding on a color and pattern without my branding final. 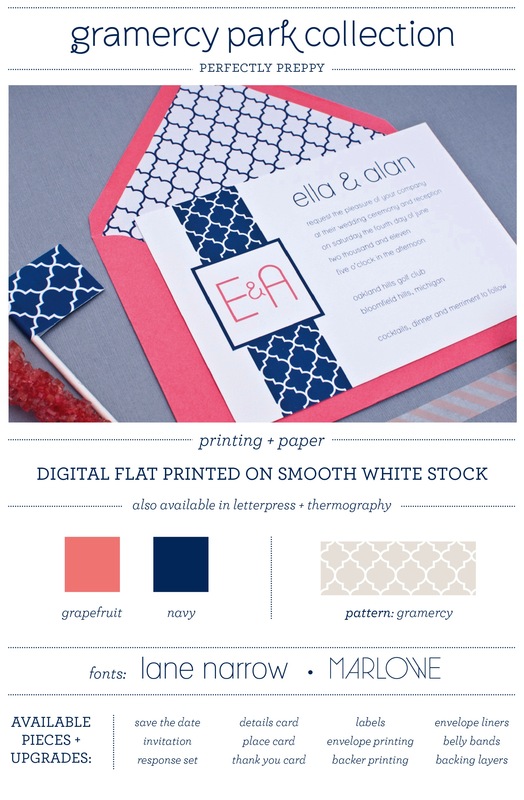 but as my brand came to life, we decided to use a few signature patterns as part of my look…the main one was going to be a chevron pattern, and i had seen a tone-on-tone version on pinterest and fell in love. and so the quest began to find a way to get my chevron pattern on my walls. 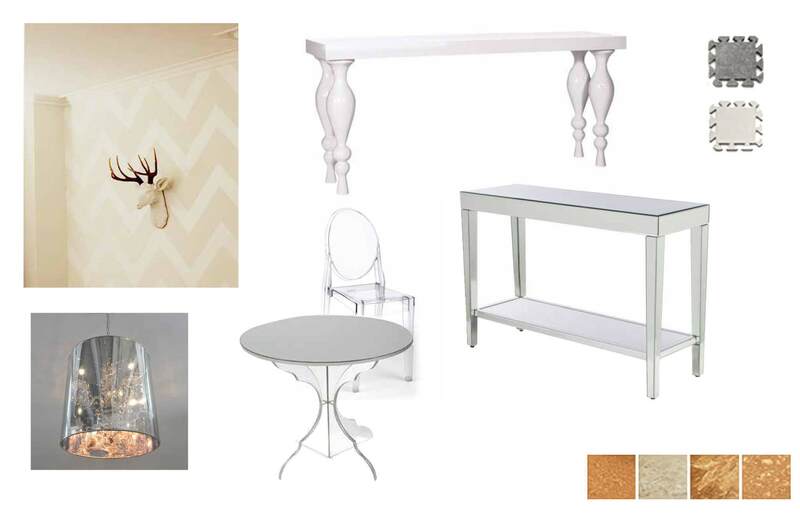 below :: the inspiration for my booth walls that i was swoooooning over! so if you are going to be exhibiting, or at all interested, research as much as possible. you’ll learn a ton and it is super important to do the leg work even if ultimately you get a great vendor referred to you…because only you can know what will work best for your brand and business PLUS you will stumble on some unexpected stuff and learn a lot along the way. 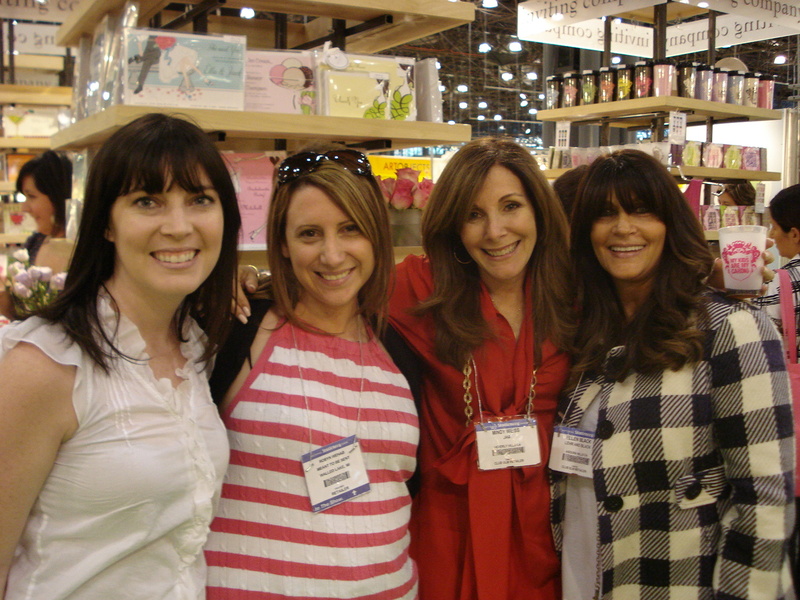 a great source was an amazing bootcamp put on by my pal katie from kelp designs along with other fabulous exhibitors, retailers and press peeps…you MUST check it out! NSS puts on seminars too, but there was something about the bootcamp that was so real and candid that really made a difference. much much more details on the booth, albums and final collection coming up! NSS recap :: part 2…decision time! so how do you decide to exhibit? for me, i knew i LOVED the custom work i had been doing, but the thing was, there is only one of me…and i can only do so many custom designs at a time. so i wanted a way to supplement that work with products that were turnkey and ready-to-order. this was originally sparked by my peacock and nautical invitations that i realized i was getting tons of orders for, pretty much just as they are. so i thought, what if i had a whole line of ready-to-order designs and maybe some boxed stuff? i thought a LOT about what my line would be—probably the biggest thing i thought about! what would i debut with—an album? multiple albums? all wedding? mix in holiday and baby? just boxed stuff?? side note : don’t hesitate to apply as soon as you decide you want to exhibit! i probably would have signed up a bit sooner, but part of the reason i didn’t was because when you apply, you submit your application and product photos…as i mentioned, i didn’t exactly HAVE products (yikes! )…so i kept holding off… BUT i knew i needed to sign up early to get a good/small space. so i finally contacted GLM in early fall and asked if i could apply even tho my new product line was not done so i didn’t miss out on the space i wanted…they said DEFINITELY! just send photos of the type of products you will be selling…i.e. photos of my custom work was fine. 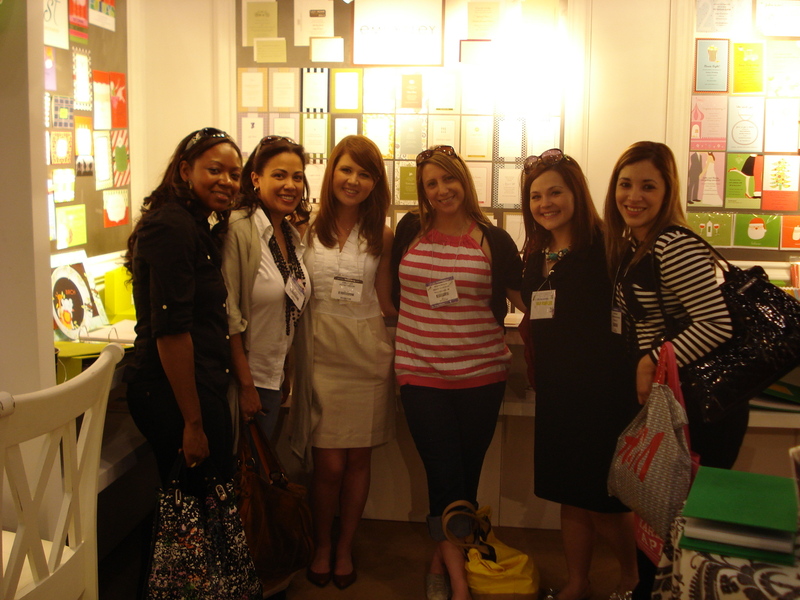 they just want to see what type of product you are selling/your style… so they can place you in the right area etc. so, whew. that was a relief. i was in! when i originally requested my space, i tried to get the smallest space available (6×10), but even 8 months before the show those spaces were gone! so i ended up with an 8×10 booth, which worked out GREAT and was just a bit more than the smaller one, in the grand scheme of things! note: moving is based on availability, but you can move with no additional charge unless your booth size changes!! 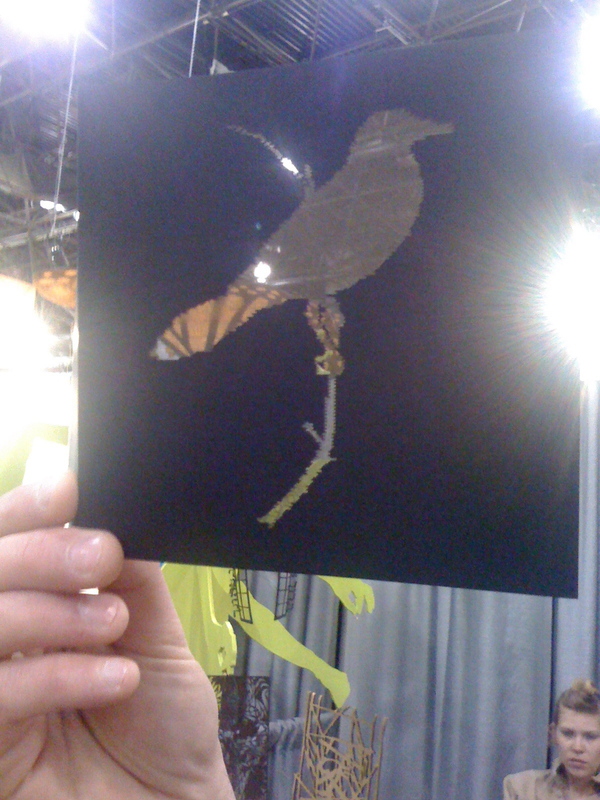 — and ended up pretty much right in the center of the show and next to a twitter pal, dingbat press! it was perfect! 4. make the decision to exhibit :: ask yourself…do i / will i have a product that can be sold wholesale and still make a profit without being way overpriced? what is that product? is it different from the competition? how? IMPORTANT :: set yourself apart one way or another! 6. sign up! contact one of the show reps listed on the NSS site prior to applying if you have any questions. they are SUPER helpful. kelly bristol was my rep, and she is fab! 7. decide on what size space you think you need. most first time exhibitors go with the smallest spaces. it makes sense financially and usually you are not debuting with a TON of products, so you don’t need a ton of space. but choose what is best for YOUR company and products. and keep in mind, that you are only paying for the space and need to fill this space with EVERYTHING ON YOUR OWN!!! 8. pay the deposit to reserve your space. yup. already time to fork over some cash! to give you an idea of the timing for payment…i reserved my space in mid october and my first payment (about 50% of the booth fee) was due about two weeks later. the final balance was due two months later. so be ready with the initial booth cost when you sign up! next up :: PART 3 — what to show? 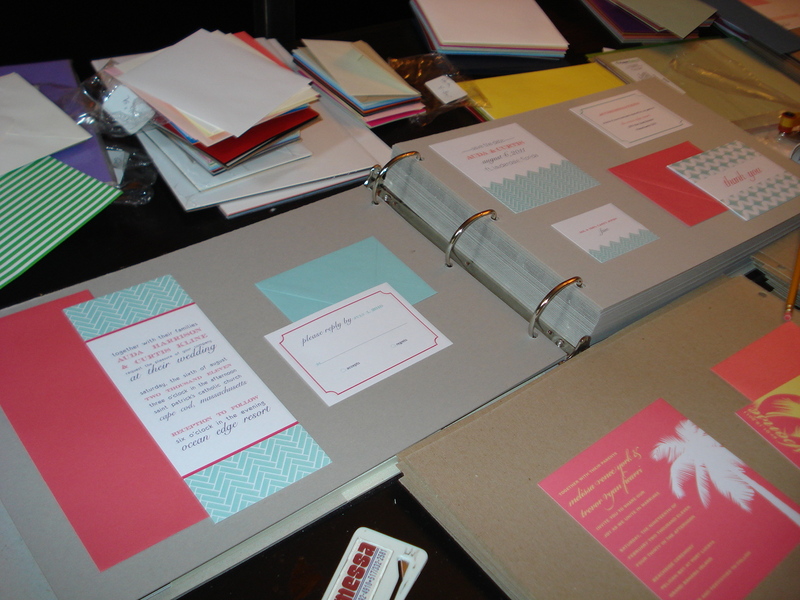 holy moly…it has been exactly 1 month since my last blog post…actually, anyone that’s been following along lately knows that in the last 3-4 months posts have been few and far between as i got ready to exhibit at my very first national stationery show. so read on for commentary, random tips and details, the nitty gritty and behind the scenes looks…and of course how it all came together at the show! 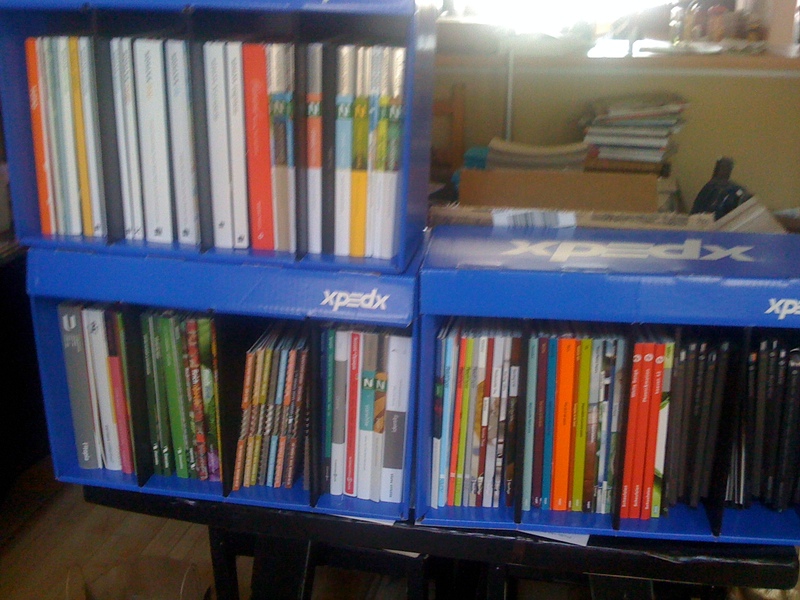 this all started about a year ago…i decided last may (at least in my head) that i wanted to exhibit this year. 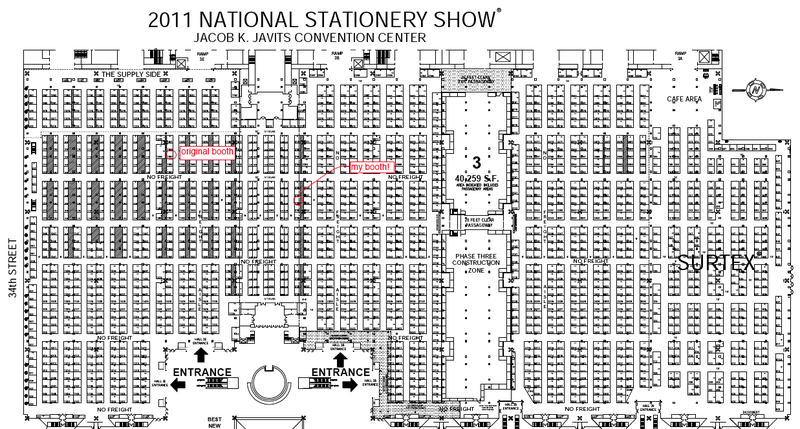 so i took whirlwind, 36-hour trip to NSS 2010 to walk the show one more time before i officially decided to make my debut as an exhibitor. i HIGHLY recommend doing this if you are at all considering showing at NSS. definitely walk the show first! it is an invaluable experience to get to see first-hand not only what the show is all about but just how BIG it is. the three years i have been to the show (including this year) it has included about 800-1000 exhibitors….so there is a LOT to see and even more to consider if you are exhibiting. 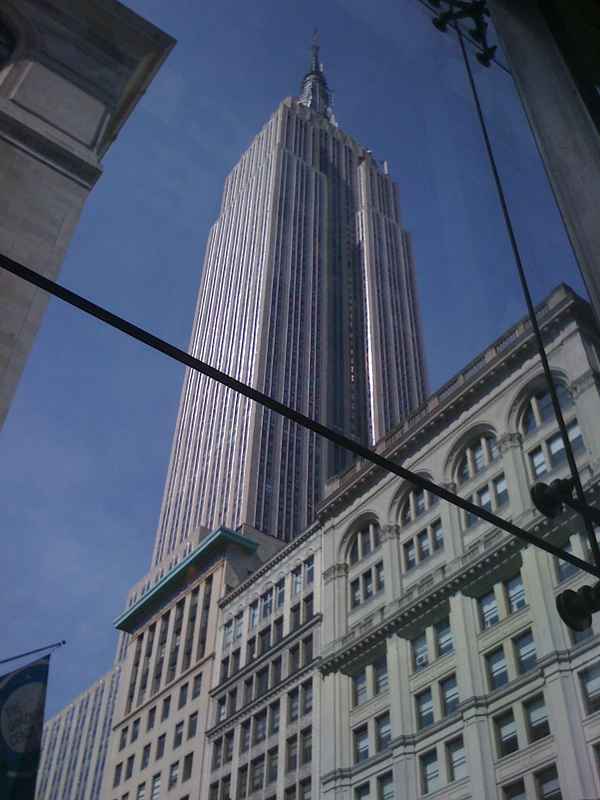 last year when i took my quick jaunt to NYC, i had a much different goal than the year before…in 2009 we went for fun and to see what it was all about and just see all the amazing eye candy. so, during my 36-hour trip…. 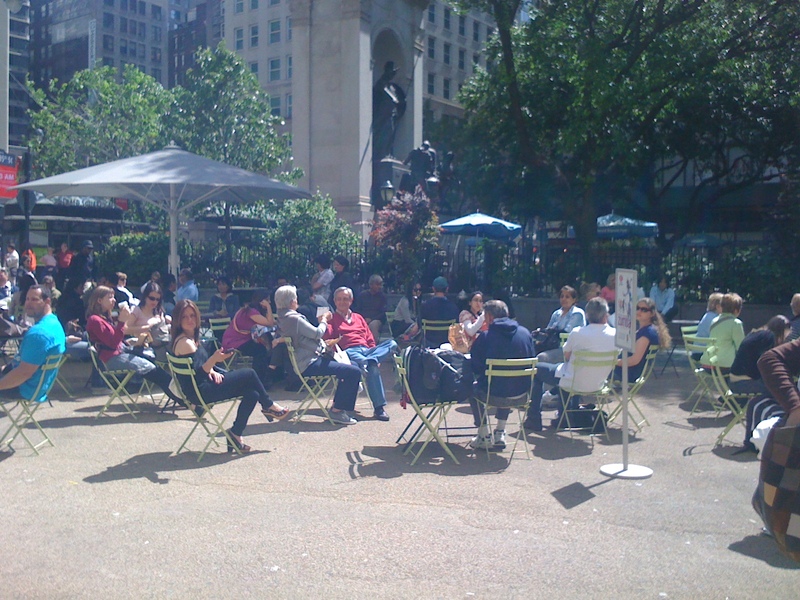 and did some mini site-seeing while in route to javits in the awesome spring weather we had! next up :: PART 2 — decision time! whew. it sure has been a while! but i am still here :) just been working like crazy getting ready for the national stationery show (just over a month away!!!! ahhh!) there is SO much going on behind the scenes over here and hope to start posting some pics (if i remember to take them!) of all this stuff very soon! so what has kept me so busy you ask? 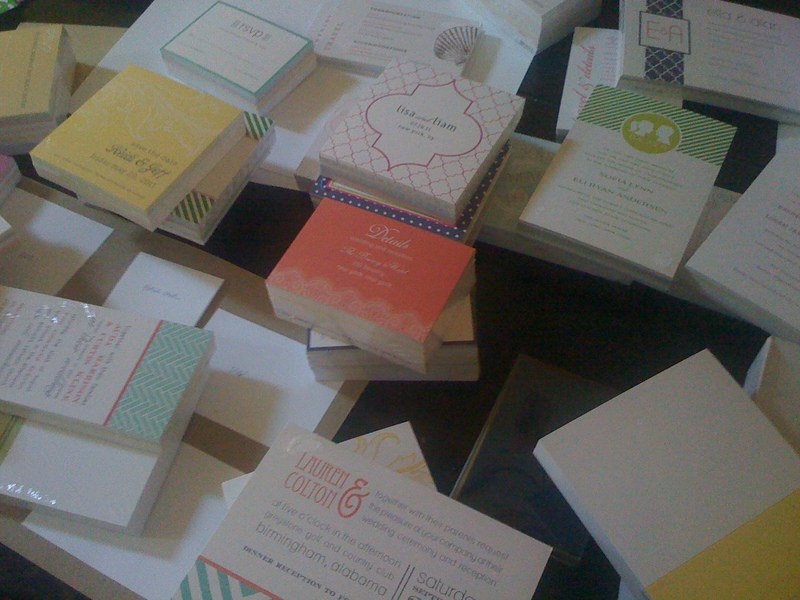 i have been working on an entirely brand-spankin’-new line of wedding stationery (which i hope to debut ALL of at the show, but it is still TBD just how many will be completely polished and ready for the world…BUT i will tell you there are 60 designs in the works! and some of those designs will also (eventually) be offered as DIY imprintables, as well as notepads and some other fun items. i cannot wait to get this all done and ready to show you! so, how about a little more detail on the new stuff? 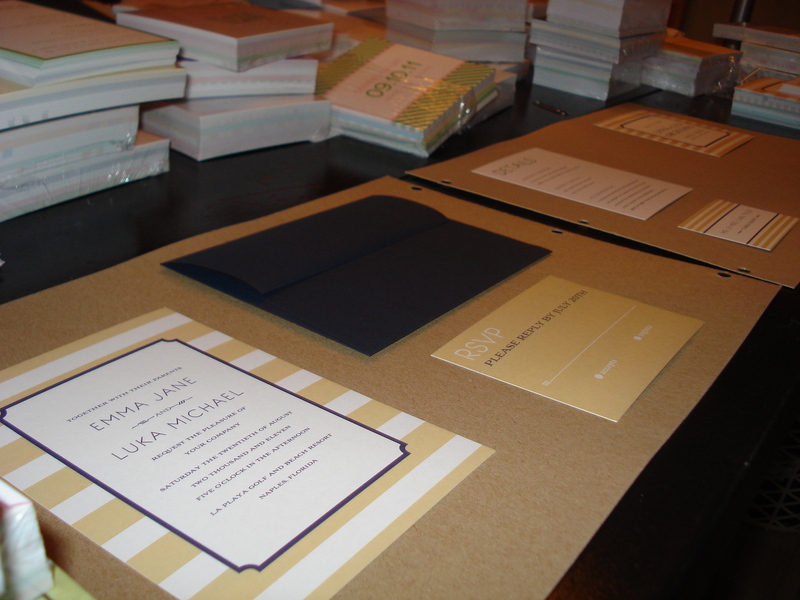 this entire process of developing the new stationery line has been based on one main idea :: a fresh, simple approach to wedding stationery. not only in look and colors, but also in the shopping and ordering process. i wanted a new idea that i could wrap my collection around that wouldn’t feel as overwhelming and cumbersome as some of the giant albums out there. so i decided to shake things up and create a style library —you guessed it!— with books organized by style/theme! 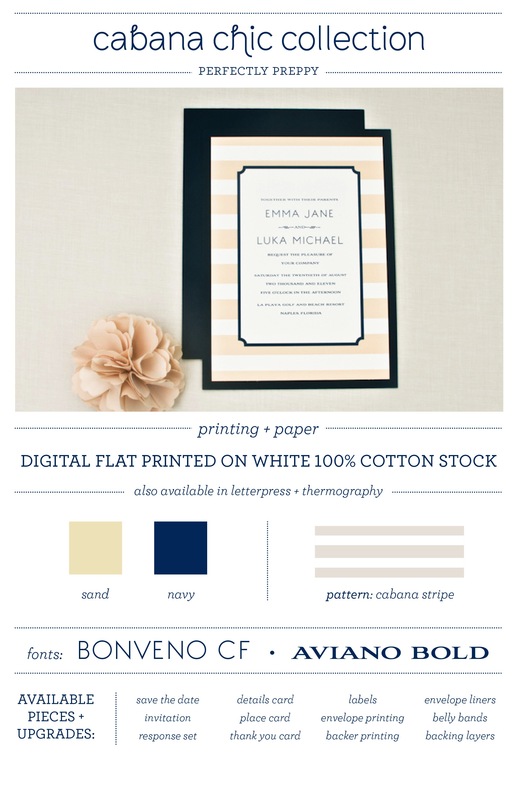 with the way weddings continue to evolve and become more and more personal, it just feels right and new and fresh…and a way to really focus on personal style when looking for the perfect wedding stationery. 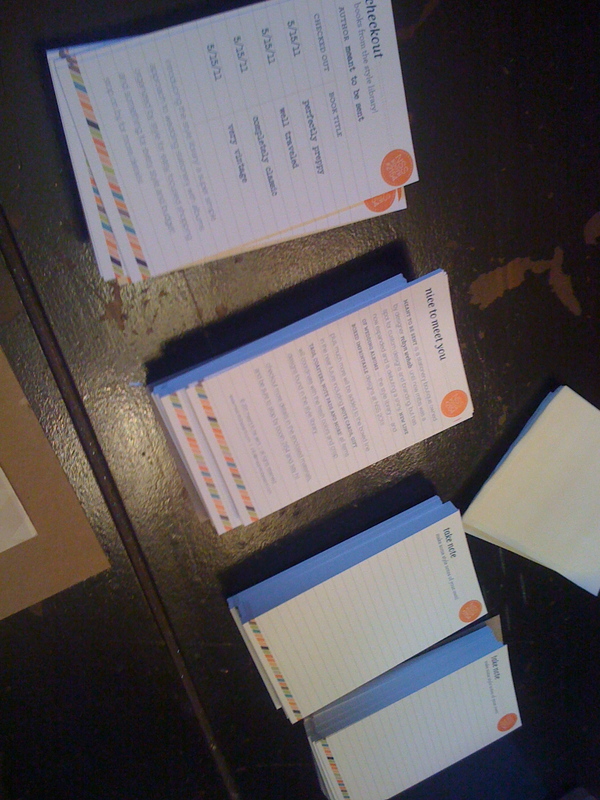 each book within the library will also be a bit streamlined (15-20 designs per book) with its own color palette, papers and fonts selected specifically for each style. pricing and options will be clear and simple too! 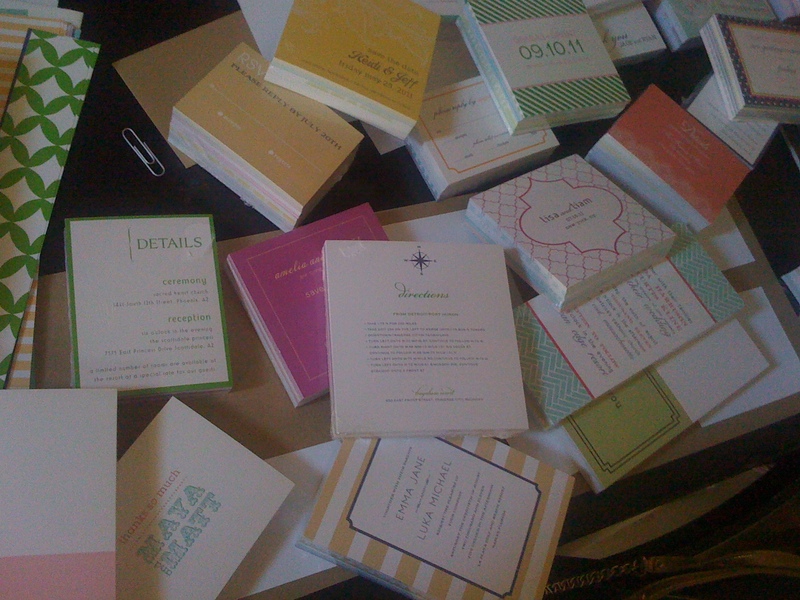 all designs will be offered with flat printing with some available in letterpress and thermography. as i mentioned, the initial roll out at NSS is TBD as i polish them up but hope to initially include four styles—perfectly preppy, completely classic, well traveled, and very vintage. and the line will continue to evolve into a full library of styles with something for everyone!! 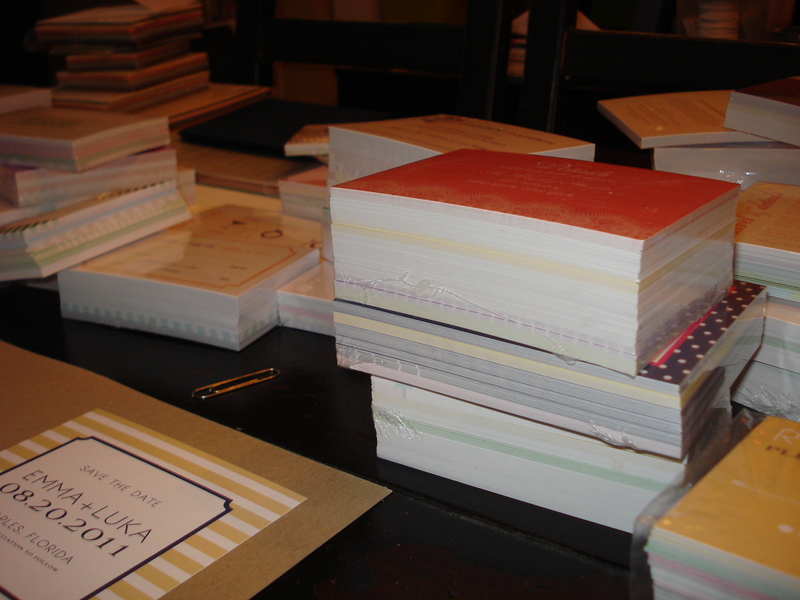 the books will be offered to retailers individually or as a set for a special rate. the designs will be available for wholesale, thru retailers and on my new site. (eeeeek!) yes, that is what else has been going on—a complete rebranding, new site + blog are in the works! my new look along with my new line will debut at the show…and for the site, i will likely do a soft launch right before NSS and have the fully functioning, shiny new site ready just after!